Chimeric Antigen Receptor modified T cells (CAR-Ts) are a powerful new tool for treating cancer. Usually, a cancer patient’s immune system can recognize cancer cells being altered, and create a natural immune response. CAR-T cells have begun to provide hope to patients without other therapeutic options to treat and cure their cancer. Acute lymphoblastic leukemia, one of the main diseases in which CAR-T cells have shown promise, has an otherwise very dismal survival despite aggressive therapies such as allogeneic stem cell transplantation. The immune cells that directly attack cancer cells are called T lymphocytes, a type of white blood cell, but sometimes they are ineffective and may fail to recognize tumour cells, fail to activate, or fail to be maintained long enough to have an impact. Recent clinical research shows that it is possible for these limitations to be overcome by isolating a sample of a patient’s T lymphocytes from their blood, genetically modifying and activating the cells in the lab, and then re-administering them to the same patient. The genetic modification step involves introducing into the T cells an extra gene that carries instructions for a new component called a Chimeric Antigen Receptor (CAR). It is “chimeric” because it contains different subcomponents fused together, and it is an “antigen receptor” because it recognizes specific features, or antigens, on the surface of tumour cells. Because CAR-T therapy is very personalized (requiring genetically engineering the patient’s own cells) there is considerable infrastructure and expertise required to deliver treatment safely and successfully. 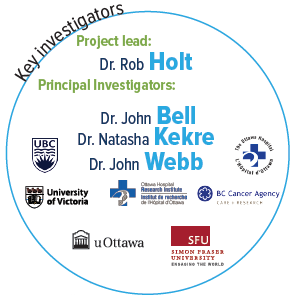 This project aims to take the first steps towards building a Canadian capacity for CAR-T therapy as a public health effort, beginning with best practices in the field and proven CAR-T design concepts. Once established, the goal will then be to extend this type of treatment to as many patients as possible, and to continuously improve CAR-T treatment strategies. 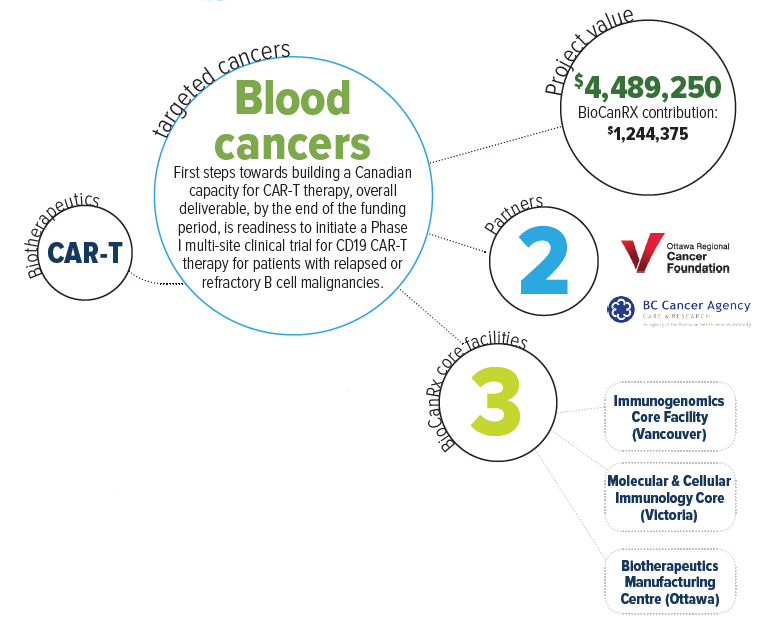 Clinical CAR-T manufacturing capabilities are currently missing from the Canadian portfolio. 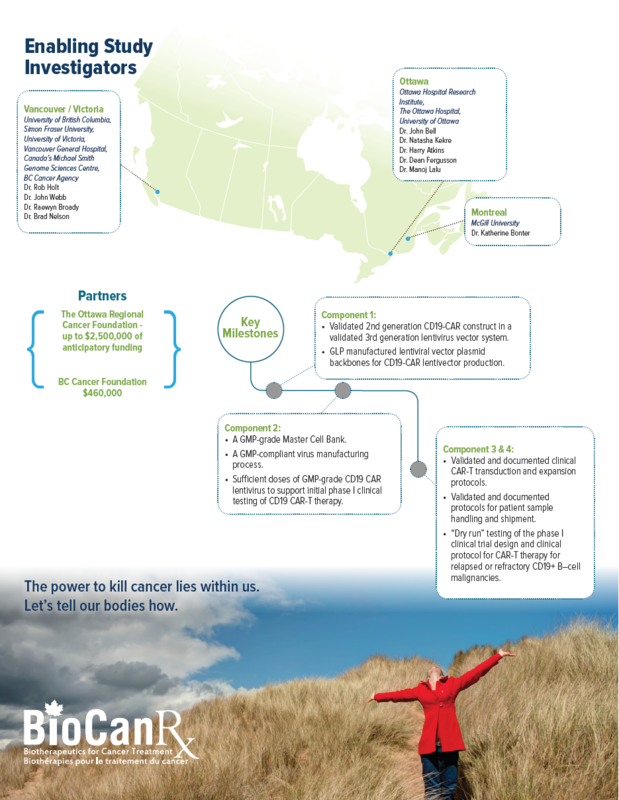 Importantly, however, BioCanRx has established an extensive network of investigators and facilities and is now well positioned to bring this necessary, effective, and highly publicized treatment to patients in Canada who are in dire need. Beginning with a proven intervention targeting B cell malignancies, Dr. Holt and team will create a CAR-T cell platform within BioCanRx that will serve as a vehicle to further improve the effectiveness of this therapy through combinationwith other existing treatment strategies including oncolytic viruses, therapeutic antibodies and novel adoptive cellular therapies. Once these basic and essential CAR-T capabilities are in place they will also be able to explore new CAR-T designs and target additional cancer types.